It remains the single most motivating factor for almost all investment decisions; yet many people are completely mistaken as to how rate of return really works. Using rate of return (ROR) as the primary way to evaluate the performance of an investment is practically universal. Early in our adult lives we become comfortable with the notion that the return provides a direct and accurate way to judge an investment’s value. Often, the pursuit of good returns leads us to change advisors, choose new allocations, or buy a given property. Since November 2008, the Federal Reserve has gone through three rounds of quantitative easing to help stimulate the economy. Whether the efforts have helped for the long-term has yet to be seen, but many expect the Fed's actions to start tapering off later this year. Here's a look at key events in the Federal Reserve's bond-buying efforts, as well as the market's reaction. With financial markets still not working smoothly two months after almost shutting down, the Federal Reserve unveils steps aimed at lowering borrowing costs for consumers and home buyers. The central bank announces plans to purchase up to $100 billion in direct debt of Fannie Mae, Freddie Mac and the Federal Home Loan Banks, along with up to $500 billion of mortgage-backed securities backed by Fannie, Freddie and Ginnie Mae (the government-sponsored enterprises, also known as GSEs). The Federal Reserve says it will buy $300 billion in longer-term Treasury bonds to help arrest a deepening slide in the U.S. economy, a surprise move that send stocks soaring and triggers violent moves in other markets. The Federal Reserve's move signals it will boost the size of its balance sheet to more than $4 trillion. Following the Fed decision, gold futures and U.S. stocks rally, while the dollar plunges against other major currencies. In the bond market, Treasury prices soar, sending yields plummeting by the largest amount since 1987. The Federal Reserve pledges to start a controversial new $600 billion bond-buying spree to rescue the economy from its current doldrums. The FOMC says it will buy up to $600 billion in long-term Treasurys until the end of June 2011, including about $75 billion this month. This is the second time the Fed engages in quantitative easing, as it snapped up $1.7 trillion in mostly housing-related assets between December 2008 and March 2010. In a statement, the Fed says it will buy $400 billion of Treasury securities in the 6- to 30-year range and sell an equal amount of maturities of 3 years or less. The purchases to be completed by the end of June 2012. The Fed also announces a new plan to purchase agency mortgage-backed securities with proceeds of maturing securities. The Dow Jones Industrial Average closes down 283.82 points, or 2.5%, at 11,124.84. This week I released my annual "Wastebook” report, featuring 100 examples of mismanagement, wasteful spending and special interest deals that illustrate just how far Washington continues to go to avoid setting priorities. If you fly across the country, it’s easy to see signs of America’s ingenuity and productivity — skyscrapers in New York City, steel mills in Pennsylvania, factories in Chicago, farmland in the Great Plains, and the glittering technology of Silicon Valley. But what you can’t see, though it’s very real, is the invisible web of red tape crawling forth from Washington, crisscrossing the landscape, strangling job creators, tying down entrepreneurs, and tangling America’s engine of innovation in a mess of regulations. Under the Obama Administration, those endless miles of government-imposed directives has kept getting longer, as The Heritage Foundation reveals in a new study released today. Are tax hikes on the way? Some federal lawmakers hope so. "It’s a great opportunity to get us some more revenue,” Sen. Charles E. Schumer, New York Democrat, recently said of the upcoming debate over the federal budget. You know what that means: calls to raise taxes on the rich. Lawmakers can’t seem to refrain from eyeing the golden goose. It seems fair to most Americans that those who earn more should pay more taxes. But how much more? You’re busy. So busy you barely have time to read these words. So why should you care about the U.S. debt? Does it affect your life? Two recent reports document anew the failure of federal agencies to meet the extensive rulemaking requirements of the Dodd–Frank statute. The regulatory backlog highlights how unworkable the law is for both bureaucrats and businesses. According to what has been publicly reported about the Gang of Eight’s forthcoming immigration bill, there appears to be a major flaw that could allow millions of illegal immigrants to access federal welfare benefits and poverty programs. Specifically, there is nothing in the framework to apply federal public charge law to those in the country illegally before they are granted legal status. What this means is that the bill would create an end-run around federal law: individuals in the country illegally could receive legal status without having to demonstrate financial self-sufficiency. Senator Byron Dorgan (D–ND) told Greenwire (subscription required) that an energy efficiency bill that passed through the Senate Energy and Natural Resources Committee would be a necessary "first step” to more federal efforts to overhaul energy policy. The Congressional Budget Office’s (CBO) official score of President Obama’s budget shows in numbers a vision for economic decline in America. The President imposes a tax increase totaling $1.1 trillion (and a net increase of about $1 trillion), some components of which would directly hit middle-class and lower-income Americans. 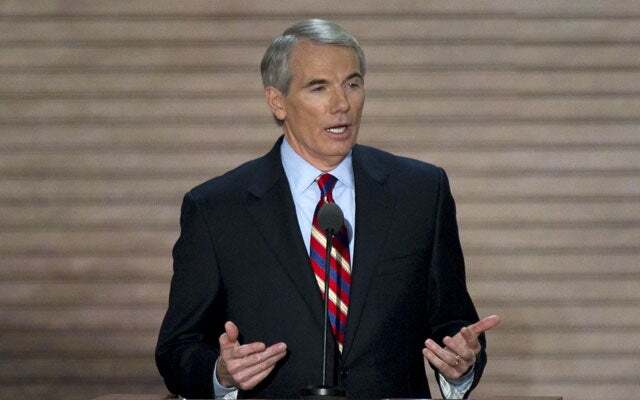 The Senate Judiciary Committee voted Monday to allow illegal immigrants who get legal status to begin collecting tax-welfare payments, as the panel spent a fourth day working through amendments to the massive immigration bill and party-line splits began to emerge. In one major change, the committee voted 17-1 to make a third drunken-driving conviction a deportable offense for the newly legalized immigrants if at least one of those offenses occurs after they are approved for legal status. The May employment report from the Bureau of Labor Statistics shows an economy running in place. Over the past year, employers have created an average of 172,000 net jobs a month. In May, they added 175,000 jobs, and the unemployment rate slightly increased by one-tenth of a percentage point to 7.6 percent. Other measures of labor market strength, such as the employment-to-population ratio, were flat. Sometime in the next few weeks, the Congressional Budget Office (CBO) will produce a "score” of S. 744, the Border Security, Economic Opportunity, and Immigration Modernization Act (known colloquially as the "Gang of Eight bill”), as recently reported out of the Senate Judiciary Committee. Federal government debt has nearly doubled since President Barack Obama took office and is projected to increase 50 percent over the next decade—and then rise rapidly thereafter—under existing policies. As federal debt has soared, so have concerns about America’s future. The President’s Midsession Review, released this week, projects the 2013 deficit to be lower by $214 billion compared with the earlier Obama budget estimate released in April. But any hurrah would be misplaced. 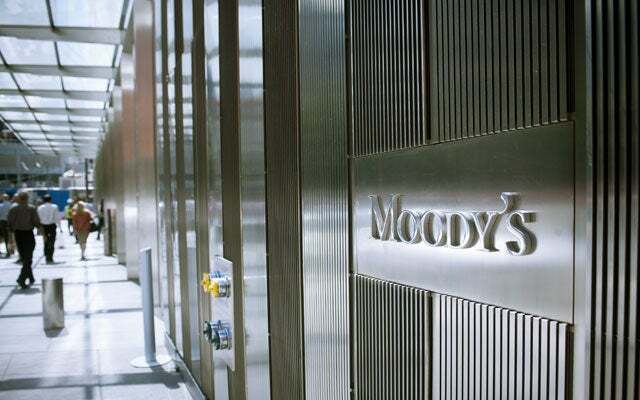 Moody’s changed the outlook on the U.S. credit rating from negative to stable this week, citing improving deficits. While this is good news, policymakers should curb their enthusiasm about what this means for the U.S. debt situation. Fidelity announced with great fanfare in mid-February that the average 401(k) balance hit a record high of $77,300 by the end of 2012. It is good news that balances are up from a year earlier, but $77,300 does not indicate success in retirement saving. There is nothing encouraging about this number. With the fracas in Washington over how to stop student loan interest rates from spiking, there’s more attention than ever on the student loan "bubble.” To pinpoint apt solutions, it’s worth considering the college loan issue as a version of two already irksome public policy problems: the debt dynamics of the mortgage bubble and the third-party-payer problem of the health care system. Buyer's Remorse on Student Loans? NEW YORK (MainStreet)—The debt load graduating students bring with them to the real word has become one of the defining metrics in the student loan crisis. Depending on who you talk to, estimates can range from the mid-$20,000s to around $35,000 if debt owed to family and through credit cards are factored in. Then there's the types of loans—public vs. private—influencing cost. In a bad job market, borrowers have struggled across the board, from law school students to beauty school grads, as though these two disparate occupations were on an equal footing. Surprising New Fed Study - Is it Preparing Americans for a Market Crash? The latest study by the Federal Reserve Bank of San Francisco (FRBSF) draws unexpected conclusions that almost make you believe a disgruntled Fed employee did it. But be assured, it’s an official study published on the FRBSF website (here is a link to the actual research report posted on the FRBSF website). The study analyzes and quantifies the effect of large-scale asset purchases (LSAPs), also known as quantitative easing (QE) and lower interest rates, on the economy and inflation. 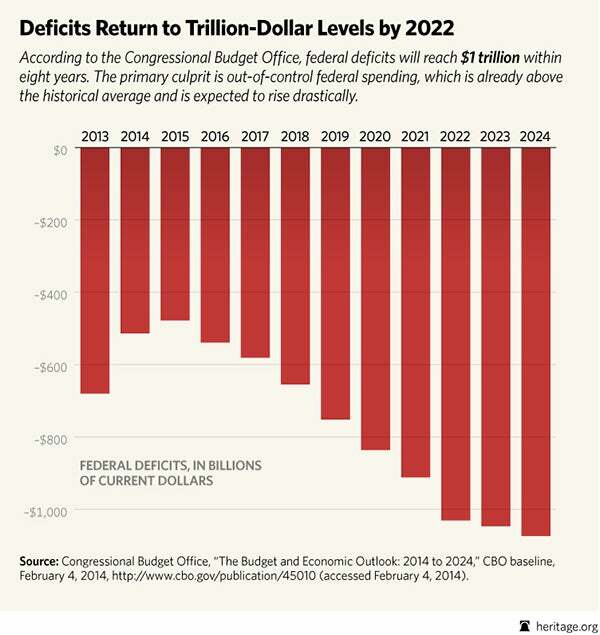 The nation’s fiscal situation is much worse today than when President Obama first took office. Public debt borrowed in credit markets stands at 73.6 percent of gross domestic product (GDP), a level last seen after World War II. And yet, the news and many lawmakers will tout a very different story. The U.S. government was barely involved in the housing finance market before the Great Depression. Subsequently, the Federal National Mortgage Association (commonly known as Fannie Mae) and the Federal Housing Administration (FHA) attained an almost legendary status for having "saved” the housing market in the 1930s with various forms of government guarantees. The perceived success of these institutions has led many—including many Members of Congress—to suggest that the housing market cannot properly function without a government guarantee. One of the great ironies is that the government programs initiated in the early 1930s were nationalized versions of innovations that had long existed in the private market. For much of human history, most individuals have lacked economic freedom and opportunity, condemning them to poverty and deprivation. Today, we live in the most prosperous time in human history. Poverty, sicknesses, and ignorance are receding throughout the world, due in large part to the advance of economic freedom. In 2014, the principles of economic freedom that have fueled this monumental progress are once again measured in the Index of Economic Freedom, an annual guide published by The Wall Street Journal and The Heritage Foundation, Washington’s No. 1 think tank. Why? Heritage experts forecasted months ago that a proposed minimum wage hike would kill the very jobs it’s supposed to support. But when the Congressional Budget Office (CBO) said the same thing this week, it forced the White House and congressional liberals to defend their calls for the increase. This impending tax increase is mostly the result of the expiration of many long-standing policies that all expire at the end of 2012. President Obama and Congress should start working together now to prevent this massive tax increase rather than waiting until the end of the year. That would assure families, businesses, and investors that their taxes will not rise sharply as the economy is still staggering to its feet and show the voters that Washington really can get important things done—even in an election year. A Drain on the Economy: High marginal tax rates and a battalion of tax distortions discourage productivity, slowing the rise in wages and economic growth and making it difficult for businesses to compete globally. Far Too Complicated: The current tax system is too complex. The income tax inflicts a multitude of rules and exceptions that lack transparency and fairness. [S]ince the most important investment many families make is their home, send me legislation that protects taxpayers from footing the bill for a housing crisis ever again, and keeps the dream of homeownership alive for future generations. That sounds magnificent, and we couldn’t agree more. No one wants another housing crisis, and taxpayers certainly shouldn’t be on the hook for it. The biggest U.S. banks are about to learn whether they can pay out more than $75 billion in excess capital to investors as the Federal Reserve completes stress tests of their ability to survive new economic calamities. Wells Fargo & Co. (WFC) and JPMorgan Chase & Co. (JPM) would lead a 69 percent increase in dividends and stock buybacks over the next 12 months after the central bank releases results of its annual tests on March 20 and March 26, according to analysts’ estimates compiled by Bloomberg. That’s assuming the companies pass, which some of the analysts say is less than assured. WASHINGTON (MarketWatch) — The arrival of spring will help settle the question everyone on Wall Street is wondering: Just how much has severe weather hurt the economy in early 2014? Economists divide into two camps. The largest one believes the weather is far and away the main reason for a slowdown in U.S. growth since the start of the year. A smaller group acknowledges the dampening effects of a harsh winter, but they suspect the economy still has pockets of weakness that are keeping it in a post-recession pattern of herky-jerky growth. 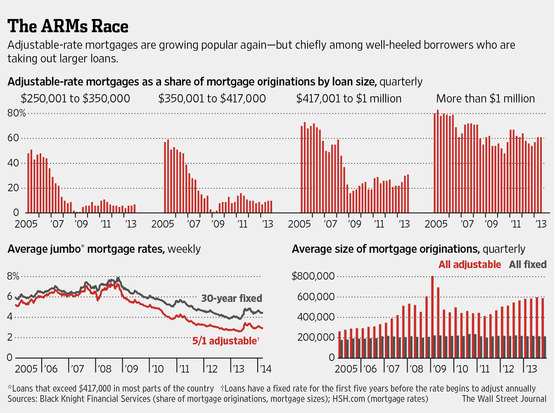 Adjustable-rate mortgages, one of the main culprits of the housing crisis, are back in vogue. But banks say this time is different. Financial groups are sweetening terms to entice customers to take out these loans, known as ARMs, whose rates can jump after a few years. Some ARMs are cheaper, when compared with fixed-rate mortgages, than they have been in more than a decade. The tactics are reminiscent of the period before the 2008 crisis, when ARMs exploded in popularity as banks and mortgage brokers touted their low initial rates to consumers. Improper accounting for Fannie Mae’s and Freddie Mac’s budgetary impact has created the illusory effect that the government-sponsored enterprises (GSEs) represent a free lunch for Washington, which is encouraging higher spending and harming efforts to eliminate the entities. The GSEs’ off-budget status excludes them from federal budget rules and processes, and hides the real cost to taxpayers from federal control of Fannie and Freddie. GSE profits paid to the Treasury in 2013 alone have resulted in federal spending and deficits being underreported by more than $100 billion. The Budget and Accounting Transparency Act of 2014 (H.R. 1872) would take an important first step toward GSE elimination by putting both entities on budget and including market risk in estimates of their cost to taxpayers. View supplemental questions for the record: What is Minimum Wage: Its History and Effects on the Economy—Questions for the Record. Recent court rulings and regulatory filings contain some important news for households with individual retirement accounts, Medicare beneficiaries with chronic conditions, and owners of variable annuities that generate a guaranteed income. Here's a roundup of the recent developments and guidance on how to use the information to your advantage. If you pull money from an individual retirement account before age 59½, you normally owe income tax on the withdrawal and a 10% penalty. But an exception known as the "once-per-year rollover rule" allows tax-free withdrawals if the funds are returned to an IRA within 60 days. How Long Can You Really Work In Retirement? My colleagues at the MIT AgeLab are conducting an informal survey of Americans across the nation asking them to identifythree things they’ll be doing in life after 65 . We don't use the "R” word in our question because asking specifically about "retirement” tends to elicit familiar, if not trite, images of gardening, golf and family gatherings. While those responses certainly make the list of the thousands of people who have taken a moment to answer, the overwhelming answer for most participating in this informal "person on the street” study, regardless of age or gender, is working. A welcome relief from rising health-care costs for U.S. consumers is being less warmly received at the Federal Reserve. The slowdown is frustrating the efforts of Chair Janet Yellen and her colleagues to lift inflation out of the doldrums, suggesting they will need to press on with record-low interest rates. Price increases, not counting volatile food and energy costs, decelerated to a 1.1 percent year-over year pace in February from 2 percent two years earlier, with medical goods and health-care services accounting for almost a third of the slowdown, according to data compiled by Bloomberg based on the government’s personal consumption expenditures price index. In 2012, the major entitlement programs-Social Security, Medicare, Medicaid, and other health care-consumed 45 percent of all federal spending. These programs, and interest on the debt, are on track to consume an even greater share of spending in future years, while the portion of federal spending dedicated to other national priorities will decline. What if a Typical Family Spent and Borrowed Like the Federal Government? Families understand that it is unwise to repeatedly spend much more than they take in. But Washington continues its shopping spree on the taxpayer credit card with seemingly no regard to the stack of bills the nation has already piled up. Runaway spending on Medicare, Medicaid, and Social Security will drive federal debt to unsustainable levels over the next few decades. Total national debt comprises publicly held debt (the most relevant to credit markets) and debt that one part of the government owes to another, such as the Social Security Trust Fund.